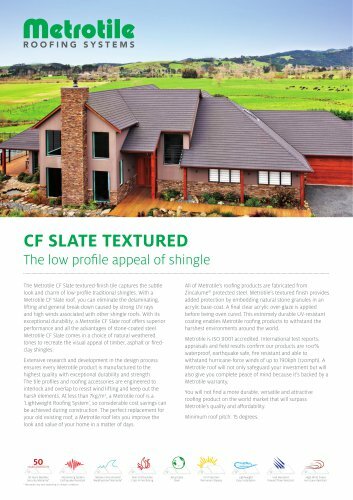 CF SLATE TEXTUREDThe low profile appeal of shingle The Metrotile CF Slate textured-finish tile captures the subtle look and charm of low-profile traditional shingles. With a Metrotile CF Slate roof, you can eliminate the delaminating, lifting and general break-down caused by strong UV rays and high winds associated with other shingle roofs. With its exceptional durability, a Metrotile CF Slate roof offers superior performance and all the advantages of stone-coated steel. Metrotile CF Slate comes in a choice of natural weathered tones to recreate the visual appeal of timber, asphalt or fired-clay shingles. Extensive research and development in the design process ensures every Metrotile product is manufactured to the highest quality with exceptional durability and strength. The tile profiles and roofing accessories are engineered to interlock and overlap to resist wind lifting and keep out the harsh elements. At less than 7kg/m2, a Metrotile roof is a 'Lightweight Roofing System', so considerable cost savings can be achieved during construction. The perfect replacement for your old existing roof, a Metrotile roof lets you improve the look and value of your home in a matter of days. All of Metrotile's roofing products are fabricated from Zincalume® protected steel. Metrotile's textured finish provides added protection by embedding natural stone granules in an acrylic base-coat. A final clear acrylic over-glaze is applied before being oven cured. This extremely durable UV-resistant coating enables Metrotile roofing products to withstand the harshest environments around the world. Metrotile is ISO 9001 accredited. International test reports, appraisals and field results confirm our products are 100% waterproof, earthquake safe, fire resistant and able to withstand hurricane-force winds of up to 190kph (i2omph). A Metrotile roof will not only safeguard your investment but will also give you complete peace of mind because it's backed by a Metrotile warranty. You will not find a more durable, versatile and attractive roofing product on the world market that will surpass Metrotile's quality and affordability. Minimum roof pitch: 15 degrees. 50 Years Weather Security Warranty* interlocking System Earthquake Resistant Marine Environments Weatherproof Warranty* Non Combustible Class A Fire Rating UV Protection Permanent Beauty Lightweight Easy Installation 1 Warranties may vary depending on climatic conditions.